Tickets are only given to those who are present. We are no longer giving groups of tickets to an individual person. Please see below for complete details. PLEASE NOTE: WE ARE NOT AT THE LIBRARY THIS YEAR! We will be located in the San Angelo Performing Arts Center at 82 Gillis Street. All tickets are free to everyone and are handed out 1 hour prior to each performance in the San Angelo Performing Arts Lobby. A line will form in our hallway/ lobby and seating is based on first come first serve. Seating is limited to about 175 per performance and all seats will be good seats. Once we run out of tickets, we will have a stand by line and try to fit in as many as possible. Our best advice is to arrive early to secure you place in line! GROUPS- we are no longer giving multiple tickets to one person! Everyone must be in your group to get a ticket. Once you get a ticket, stay in the building and in line. Once you leave, you lose your place. Your ticket guarantees your place in line, but if you leave, it does not guarantee a seat if you come back and we've already opened the doors. The show is written and performed for pre-readers and early readers ages 3 years-10 years old. Babies are welcome, but we ask that strollers and carriers are left in the hallway, and children who become fussy are taken out of the performance space. Babies under the ages of 3 are not allowed to sit on the floor without a parent. We do have handicap seating available and ask that one of our staff is alerted upon arrival to make sure we can accommodate a wheelchair before it gets too crowded. The show is approximately 30 minutes. Every child receives a free Dr. Seuss board book after the show! After the performance, the cast will stay and greet the kids and sign character autographs and be available for photos. Unfortunately we cannot travel to schools to perform the entire show due to our cast being either students or professional working adutls who have jobs during the day. Also, the set is so large, it is not constructed for travel. Come see the show at San Angelo Performing Arts Center! On Site visits are full. We are no longer able to accomodate visits. Thank you for your interest! TOM GREEN COUNTY LIBRARY STORYTIME! LET'S LOOK AT NUMBERS AND LITERATURE ALIVE! These are big numbers making a difference in the lives of our young community members who are just beginning to read. 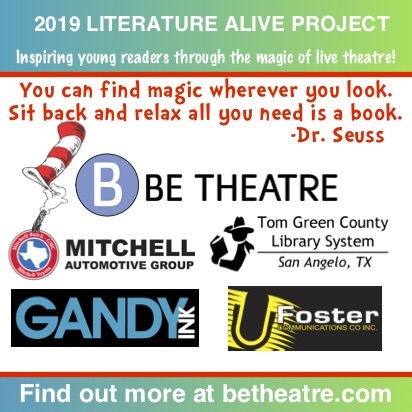 The Literature Alive Program has inspired thousands of children through the magic of live theatre, and continues to bring outstanding programming to Concho Valley children at no charge to the families who attend. PERFORMANCE ART AND LITERATURE TOGETHER! In addition to bringing classic children's literature to families, we also provide exposure to the performing arts, as many of the children who attend have never seen a live theatrical performance. Although we have children from all socioeconomic backgrounds, our highest attendance and biggest focus are families in the lower income bracket. Low income families have less financial means to purchase tickets to live performance events such as theater and dance. As commonly known, studies have shown exposure to the performing arts is extremely important in development, and we are proud to produce such an enriching and exciting event each year. 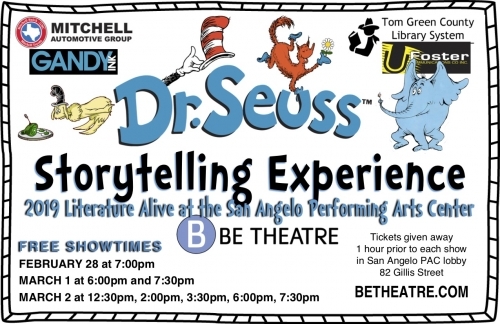 While continuing our strong partnership with Tom Green County Library, we will be moving the Literature Alive Program to the San Angelo Performing Arts Center and producing the show inside Be Theatre’s Black Box Theatre. While the allure of the library is quite warm and charming, the community room where Literature Alive has been produced the past 7 seasons has become difficult for us due to constraints on size and limitations for production. Safety is also an issue as it was not built to house a full theatrical production. SPONSORSHIP OPPORTUNITIES: There are many ways to help make this outreach event possible. If you are internested in sponsorships, please email elena@betheatre.com. Sponsors get perks such as logo recognition and a preview party with the cast for our final dress rehearsal. ARE THERE BE THEATRE MEMBER BENEFITS? If you are a current member of Be Theatre, we will be opening our final dress rehearsal for no charge. You must be a current member of our theatre to attend. Members are welcome to bring up to 2 guests per membership. More information will go out to specific members when we get closer to the production.